Be the master of strategy. Be the ultimate fighter. Be the complete warrior! 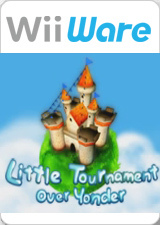 Enter the world of Little Tournament Over Yonder. Play as a young Prince or Princess leading your team through numerous battles. Plan and deploy your units to gain strategic advantages. Launch real-time battles between units and fight hard, fight fast, fight smart. Build your team, hire new units with different powers; groom them with battle experience to gain level. This is a game that involves strategy-planning and real-time fast-paced fighting. This is the game for the complete warrior, one who works his mind and his muscles. Go for Single-Player Tournament quest and glory, or challenge your friend in a 2-Player Versus match. The graph below charts the compatibility with Little Tournament Over Yonder since Dolphin's 2.0 release, listing revisions only where a compatibility change occurred. This page was last edited on 19 January 2018, at 01:00.